Schlomo Schapiro: Thank You LinuxTag 2013! LinuxTag is over and I am almost dead. Besides my own talk about Open Source Sponsoring I also gave the Data Center Automation with YADT and the Relax and Recover for UEFI Systems talk, one talk each day. 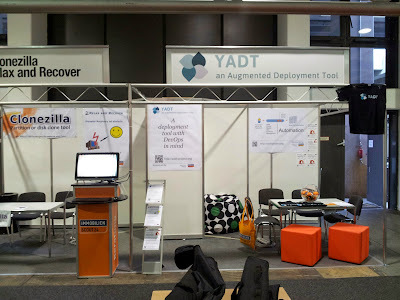 But, despite the smaller venue this year, LinuxTag is still an Open Source highlight for me. Our YADT booth was quite busy, even during the sessions. It is really good to meet so many people again, who come every year. Even better yet, I each time also meet new people who make the whole effort worthwhile. I also think that we nicely managed to raise the general awareness for YADT. So, big thanks to the organization team and see you next year!